Written by experienced teachers, authors and examiners, Advanced TopicMasters take students beyond the basic textbooks. Each title explores the key questions and debates surrounding the topic, helping students to identify, analyse, interpret and evaluate the material presented. These skills are developed through a series of short, source-based tasks that appear in each chapter and are accompanied by guidance notes on how to tackle the questions. Helps students to improve their coursework and exam preparation through specially tailored exercise. 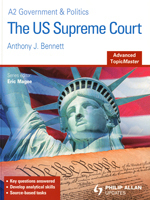 Anthony J. Bennett, an experienced teacher and examiner, has been writing on American politics for over 20 years. His other publications include the highly successful A2 US Government & Politics (3rd edition) textbook, the US Government & Politics Annual Survey and the AS US Government & Politics Exam Revision Notes, all published by Philip Allan Updates.